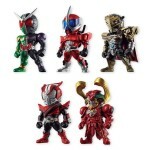 The third instillment of the Kamen Rider Converge series’ been fully revealed. Converge Vol.3 Kamen Rider will contain fan favrioute Kamen Rider W Cyclone Joker, Kamen Rider Accel, and the Utopia Dopant. 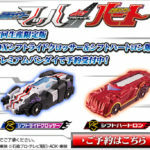 Continuing with the police theme that this assortment seems to be going for, we’ll also be getting Kamen Rider Drive Type Speed and the Heart Roidmude. Converge Kamen Rider Vol.3 will be released in this September. “We learn from humans! How to evolve beyond you, all so we can one day rule over you!” It’s time to unleash the true Dead Zone with the power of S.H. Figuarts Heart Roidmude from Kamen Rider Drive! Heart is a whole new beast of a figure for this line. 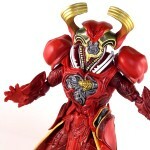 A recent Tamashii Web Exclusive & the 1st and so far only Roidmude release, Heart is a gorgeously sculpted & detailed miniaturization of series designer Takeyuki Takeya’s full size suit. If you love incredible organic detailing then this might be the figure for you. However this figure is not without faults, as we’ve detailed in the full review. We’ve assembled over 50 images of S.H. Figaurts Heart Roidmude for your viewing pleasure, though only a selection are attached to this post. To see the rest as well as a full review of the figure please click “discuss on the TokuNation forums” at the bottom of this post! Next time we’ll be back with S.H. 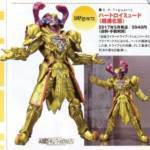 Figuarts Tridoron!